More photos are available in a gallery. 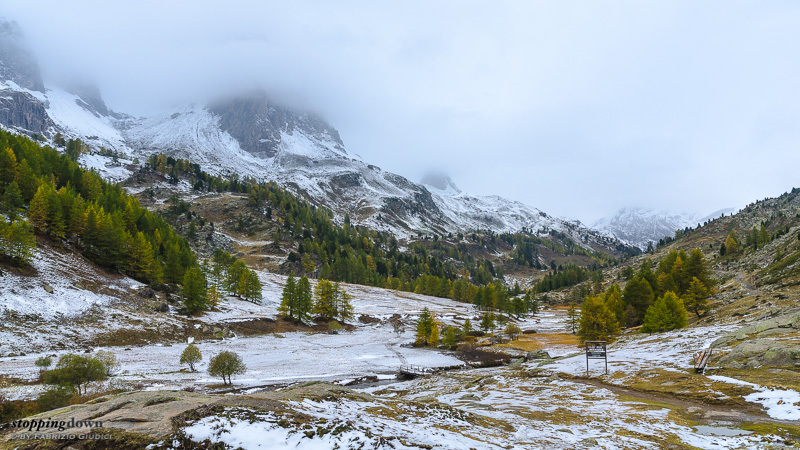 One year ago, precisely in the middle of October, I was able to stay a few days in the Alps, just when the first snowy storms brought some white over the fall colohrs. It was fantastic, so two weeks ago I retried - even though this year I couldn't allocate more than a single day. 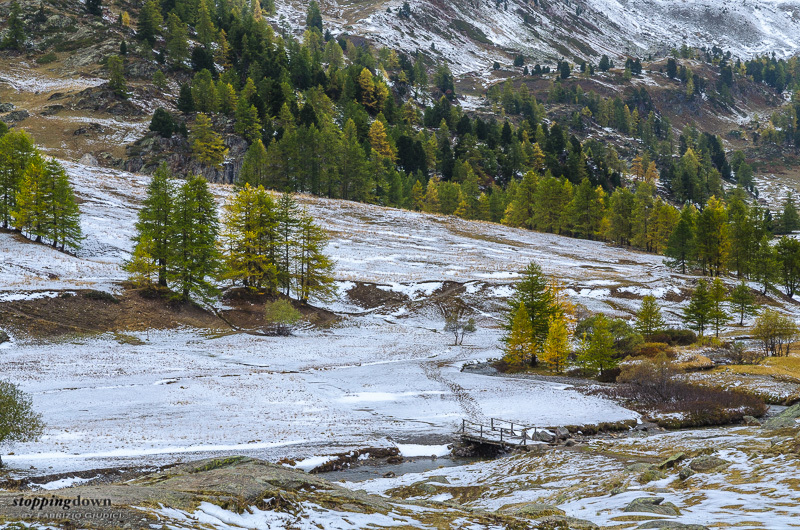 I changed location, visiting the Val Névache that I discovered in the past June. 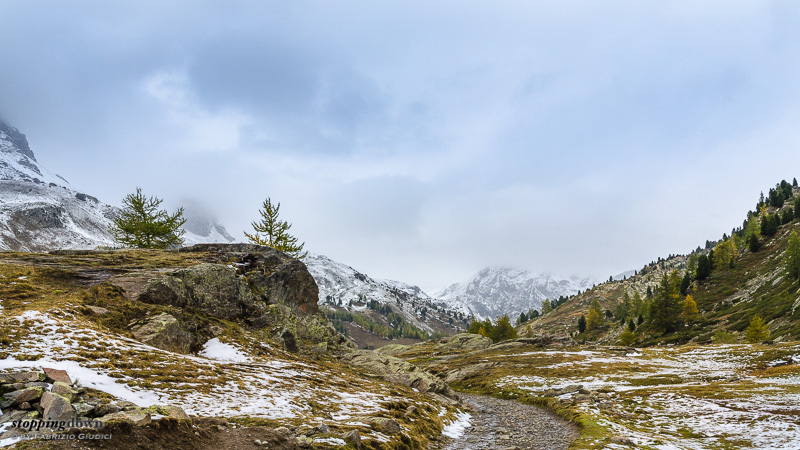 Première neige dans la Vallée de la Clarée. Nikon D5100 + Nikkor 18-70mm ƒ/3.5-4.5G ED DX AF-S @ 18 mm, 1/320 sec @ ƒ/11, ISO 220, hand-held. Nikon D5100 + Nikkor 18-70mm ƒ/3.5-4.5G ED DX AF-S @ 34 mm, 1/200 sec @ ƒ/11, ISO 110, hand-held. It looks like weather forecasts for the Alps are always difficult to interpret. The day was initially forecast as a sunny day, later as stormy and rainy. 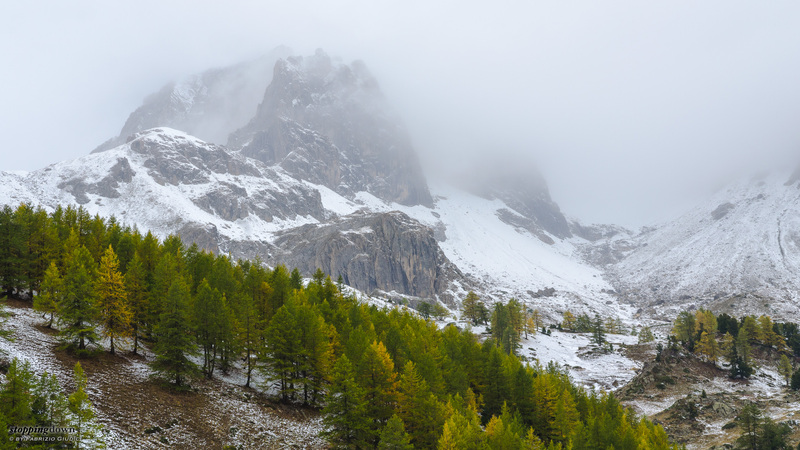 Fortunately, it turned pretty ok for landscape photography: covered sky, but with some texture, snow at higher altitudes and very light rain below, allow me to operate without too many complications (I am not the photographer who like challenge hard weather). Nikon D5100 + Nikkor 18-70mm ƒ/3.5-4.5G ED DX AF-S @ 22 mm, 1/200 sec @ ƒ/11, ISO 125, hand-held. Nikon D5100 + Nikkor 18-70mm ƒ/3.5-4.5G ED DX AF-S @ 56 mm, 1/200 sec @ ƒ/11, ISO 160, hand-held. 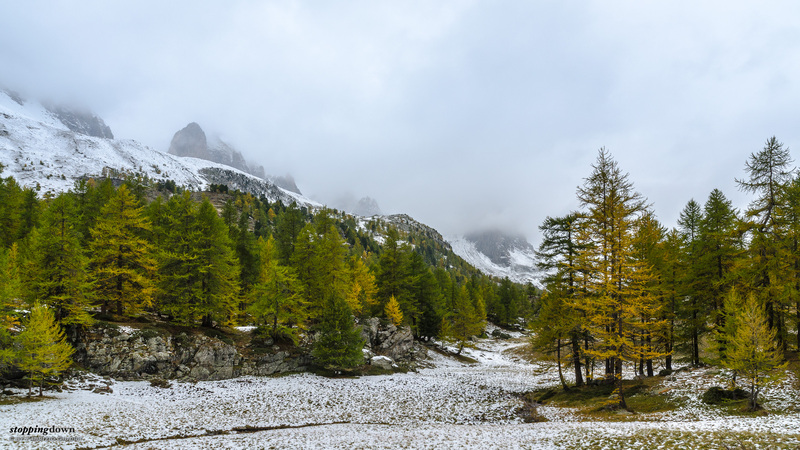 The mountains were partially hidden by mist and covered with a good amount of snow, while larches and other trees were still a plentiful palette of green and yellow fall colours. Nikon D5100 + Nikkor 18-70mm ƒ/3.5-4.5G ED DX AF-S @ 52 mm, 1/200 sec @ ƒ/11, ISO 180, hand-held.